While others charge per vent, we have a flat rate. We guarantee one low price for the whole house, with no hidden fees. Our staff are non-commissioned and not paid per house, that means we take the time to get it done right. 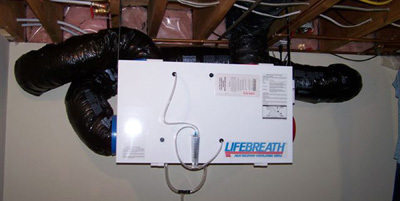 A heat recovery ventilator (HRV) brings in fresh air from the outside, preheats the incoming air during the winter and precools the incoming air during the summer. It can provide clean fresh air every day while helping to keep energy costs low. One set of ducts collects stale moist air from the kitchen, laundry and bathrooms. This stale contaminated air passes through the HRV unit and is exhausted to the outside. The other ducting system draws in fresh clean air from outdoors through the HRV unit. As the two air streams pass each other within the heat exchanger core, heat is transferred from the outgoing stale air to the fresh incoming air. There is no mixing of air streams. The HRV unit is able to capture up to 85% of the energy from the outgoing stale air. Filtered, preconditioned fresh air is delivered where you need it – in the living areas of your home. How we perform an HRV Duct Cleaning. One of our Aero Technicians will inspect your HRV to ensure that it is working properly. If any abnormalities are discovered, the technician will be sure to inform the customer. We remove the core and the filters which are set aside for cleaning later. The vacuum hose is securely installed into the HRV to create negative pressure on the whole ducting system. The air line is set up from the furthest duct, leading to the air compressor in the truck. The vacuum and air compressor are turned on. All diffuser vents are cleaned and air washed with 180-200 psi of air pressure. As a result, all contamination inside the fresh air and stale air exhausts will be pushed and blasted down to the vacuum attached to the HRV. Although the force of the vacuum and air pressure is tremendous, it will not harm or alter your duct work. After all the vents, stale air and fresh air supply runs have been brushed and blown out, we proceed to clean the supply lines with a wide array of pneumatic tools to agitate the ductwork. We also use blow back tools that we can shoot into the ductwork to pull debris and contamination back to the vacuum to remove it from the system. We then clean the inside of the HRV including the motors, the filters and the core, with the vacuum continuously running. We will then wipe clean the inside of the HRV with cleaner and disinfectant before putting the core and filters back inside. The HRV will be turned on and the technician will make sure that the HRV is cycling properly. Any messes that are made around the diffusers are vacuumed and cleaned up.